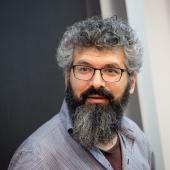 Described by The New Yorker as “empowered by modern technology but haunted by a spirit of immemorial darkness,” The Boston Globe portrays Keeril Makan as a composer “whose music deserves to be more widely heard.” Recipient of a Guggenheim Fellowship and the Luciano Berio Rome Prize from the American Academy in Rome, he has also received awards from the American Academy of Arts and Letters, the Howard Foundation, the Fromm Foundation, Meet the Composer, the Aaron Copland House, the Utah Arts Festival, the Fulbright Program, and ASCAP. His work has been commissioned by the Bang on a Can All-Stars, American Composers Orchestra, Harvard Musical Association, Pacifica Quartet, and Carnegie Hall, among others. Ensembles that have performed his work include the Chamber Music Society of Lincoln Center, the Scharoun Ensemble Berlin, the Boston Modern Orchestra Project, the New Juilliard Ensemble, the Nouvel Ensemble Moderne, and the Boston Chamber Music Society. His music was featured at a Miller Theatre Composer Portraits concert. His CDs, In Sound (Tzadik), Target (Starkland), Afterglow (Mode) and Letting Time Circle Through Us (New World) include performances by the Kronos Quartet, Either/Or, and the International Contemporary Ensemble. Persona, his opera, commissioned by Beth Morrison Projects and National Sawdust, is an adaptation of Ingmar Bergman’s classic film, with a libretto by Jay Scheib. The New York Times praised Persona: “Music comes first in any opera, and Mr. Makan’s 85-minute score, roughly as long as the film, compellingly drives the drama in Persona. Mr. Makan sets the text with striking sensitivity to when a moment demands conversational naturalness or supple lyricism,” and the LA Times described the music as “brilliant.” In addition to the premiere at National Sawdust, Persona has been performed at the Isabella Stewart Gardner Museum in Boston, and by the Los Angeles Opera. Makan was raised in New Jersey by parents of South African Indian and Russian Jewish descent. After training as a violinist, he received degrees in composition and religion from Oberlin and completed his PhD in composition at the University of California–Berkeley, with additional studies in Helsinki and Paris. Makan makes his home in Cambridge, Massachusetts, where he is the Michael (1949) and Sonja Koerner Music Composition Professor at MIT.